Ching Shih commanded a deadly pirate fleet that terrorized the China Sea in the early 1800s. She’s known as the most successful pirate in history. And OK, Ching Shih is more villain than hero, but her notorious antics teach us a valuable lesson—don’t let anyone underestimate you. Maybe you’re a communications director with little sway on a large staff. Maybe you’re an admin with communication duties tacked on to your job description. Maybe you’re a one-person volunteer team. Don’t let any of that hold you back. It didn’t stop Ching Shih. There’s no honor in going down with the ship. You just go down with the ship. She started out as a prostitute in a floating brothel. But Ching Shih managed to marry the fearsome pirate Cheng I—either by seducing him or striking a business deal—and left her lowly origins far behind. This marriage gave her a huge stake in the piracy business, which she had a part in growing into the formidable Red Flag Fleet. Six years later her husband died, and she worked to consolidate power, positioning herself as a sort of pirate queen. At the height of power Ching Shih commanded an armada of 1,800 ships and as many as 80,000 pirates. Much like Ching Shih, you can rise to power in your church office. OK, not really. We’re definitely not suggesting a savage pirate insurgency against your senior pastor. C’mon, you’re on the same team. We are suggesting you make the most of your position. Ching Shih didn’t accept her fate as a forgotten prostitute. She negotiated her way to power. She made herself indispensable to other captains. She forged partnerships and alliances that strengthen the Red Flag Fleet. It wasn’t all plundering and pillaging. Likewise you need to build relationships with other ministry leaders. It’s not about consolidating power, but it is about coming up with mutual wins. Make yourself indispensable. Find occasions to prove your worth and build trust so the next time you suggest a new idea they might just listen. A vast group of marauders doesn’t manage themselves, so Ching Shih instituted a code of laws to dictate her pirate’s behavior. Rule number one: Disobey orders and lose your head. Literally. Stolen booty had to be shared. Deserters had their ears chopped off. Pirates who raped female captives were put to death. Every church communicator should have their own version of the Pirate Code. Though you might call them policies and guidelines instead of rules and laws, and infractions probably aren’t punished so severely. But you have to institute some order. Guidelines and best practices can help you say “no” when ministries ask for something you can’t deliver. Then offer them another approach that can still get a win (remember, be indispensable). Most pirates don’t retire. They go down in glorious battle, right? Not Ching Shih. She wanted to live long enough to enjoy all that pirate treasure. Even though she had once reduced the Chinese fleet to fishing boats, a series of defeats against the Portuguese Navy signaled the coming end of the Red Flag Fleet. So Ching Shih negotiated amnesty with the Qing dynasty that allowed the vast majority of her pirates to go free—and keep their loot! They just had to surrender their weapons. Not one for the quiet life (or moral life, apparently), Ching Shih went on to open a gambling house and brothel, where it’s rumored she smuggled opium. She died in bed surrounded by her family at the age of 69, a remarkably long life for a dangerous pirate. The lesson for church communicators? Nothing. It’s just a cool story. Oh wait, here’s one: Don’t work yourself to death. It’s good to work hard, but there also comes a point where you need to call it a day. There’s no honor in going down with the ship. You just go down with the ship. Ching Shih’s lifetime trajectory from prostitute to pirate to pimp is obviously not something to emulate (duh). But she did have some successful strategies amid her murderous ways: make the most of your position, set some guidelines, and know when to call it quits. It’s not exactly swashbuckling, but it can still save the day. If you’re not feeling like swinging into action like the legendary pirate queen Ching Shih, maybe you need a pep talk. You’ve got this. Seriously. 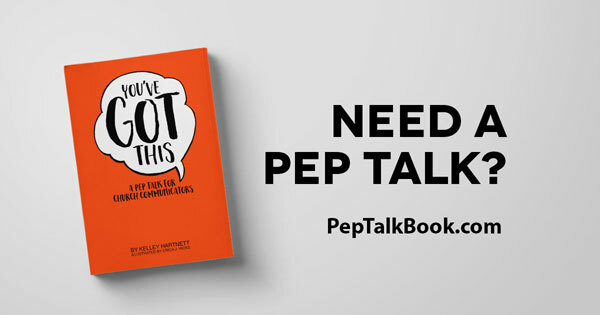 Score a treasure-trove of insight and encouragement with our book, You’ve Got This: A Pep Talk for Church Communicators by Kelley Hartnett.